This authentic flavour boosts Simba’s tangy flavour segment, which currently includes the well known Mrs Ball’s Chutney, Salt & Vinegar and Tomato Sauce. Simba Steers Monkey Gland flavour is geared to build onto Simba’s recently introduced ‘Mapha’ campaign to promote the sharing occasion. The ‘Mapha’ campaign is centred on the joy of sharing, and is entrenched in Simba’s heritage and legacy as a sharing brand. “At Simba, we believe in giving our customers an authentic South African flavour experience. The new flavour, which delivers a bold and delicious taste, enhances our current range and offers the market additional opportunities to share” says Roma Ramkhelawan, Senior Brand Manager at Simba. 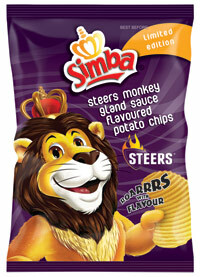 The new Simba Steers Monkey Gland Sauce flavour launch will be supported by a cross-platform promotion. This will include point-of-sale, television tags, in-store promotions and sampling activations across South Africa as well as form part of the famous Steers Wacky Wednesday promotion. Limited edition Simba Steers Monkey Gland is available nationwide between June and December 2013 in the large 125g and 36g packets.